Diplomatic efforts are once again under way to establish a more lasting ceasefire in eastern Ukraine via the "Minsk peace talks redux" (see story). While Angela Merkel's diplomatic efforts should be applauded, chances for success remain poor. The Russian government simply has no incentives to stabilize the situation. Applying pressure on Western-backed Ukraine is part of Russia's foreign policy with significant popular support. Putin is not as interested in the Russian insurgents in Ukraine gaining autonomy as he is in embarrassing the West. The military threat and the resulting humanitarian crisis in the east however are only a part of the threats Ukraine is now facing. The nation's economy is in deep trouble and the fiscal situation is becoming increasingly untenable. The nation is running out of foreign exchange reserves after defending the currency in the face of significant capital flight over the past couple of years. Exports have collapsed, with Russia being the key export market. Desperate to stabilize the currency without wasting much more of the dwindling reserves, the central bank hiked interest rates to 19.5% last week. Domestic credit markets are now shut. To relieve the pressure from capital outflows, the Ukrainian currency (hryvnia) was allowed to plummet some 36% against the euro last week - an unprecedented move. There is very little the central bank can do now. 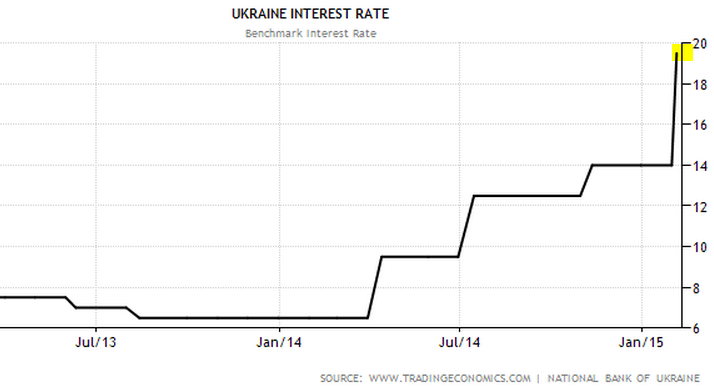 Such currency weakness will sharply exacerbate Ukraine's inflation, which is already running close to 30%. And growth is now deep in negative territory. The GDP, the industrial production, and retail trade are all experiencing a double-digit contraction. Default or debt restructuring in 2015 is now inevitable. Some of the recent proposals have focused on simply extending the nation's bond maturities. 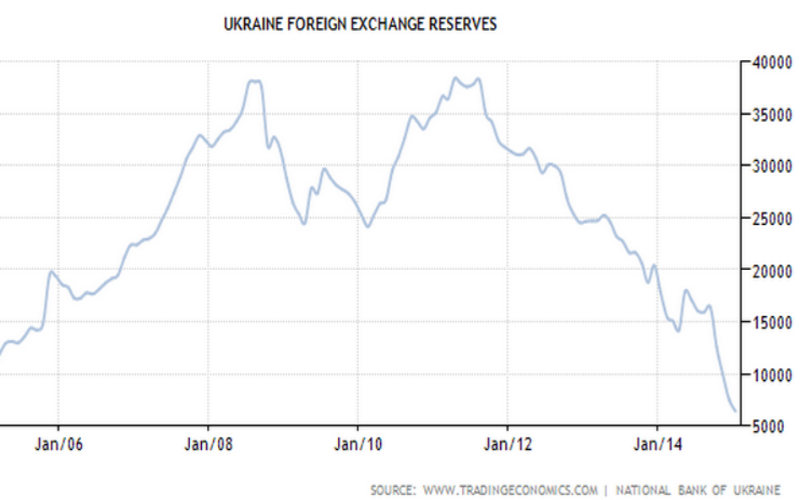 Foreign currency denominated bonds (Ukraine's eurobonds) are of particular concern (chart below). But Ukraine has other FX denominated debt outstanding - including USD-based bonds issued domestically as well as debt to the IMF. Most of the dollar-denominated bonds already trade around 50 cents on the dollar. Whether maturity extensions or a principal haircut, unless Ukraine sees fresh bailout funds soon, a credit event is now just a matter of months - possibly weeks. The current economic and fiscal trends are unsustainable and the near-term dollar-denominated debt maturities are simply untenable.